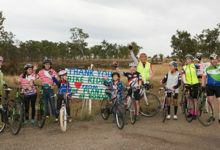 C2K2019 - a 780km bike ride across the top of Australia from Cairns to Karumba raising funds for the kids in this remote region. To better their education opportunities and their lives and the lives of the individuals in these remote communities. Early in the life of the event the decision was made to spread the benefits of funds raised to include many communities and organizations across the North Queensland region. The main criteria involved the benefits being focused on supporting and benefiting children who live in the remote rural areas of the region. Today beneficiaries include: Cairns School of Distance Education, State primary schools – including Mt Garnet, Mt Surprise, Georgetown, Croydon, Normanton and Karumba as well as child care centres, sports associations and more.